The Mughal Empire is crumbling. With the death of his beloved queen Mumtaz, Emperor Shah Jahan slowly loses interest in everything, confining himself to his bed, while his sons conspire and scheme to gain control of the empire. 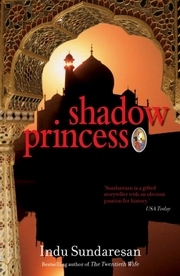 Princess Jahanara is only seventeen when the weight of the imperial zenana is thrust upon her. Shah Jahan’s favourite daughter, she is the most important woman in the harem and is forced to remain at the Mughal court all her life, caught up in the intrigues and power politics of her sisters and brothers, sacrificing her own desires for the sake of her father. Rich in detail and atmosphere, here is another glorious retelling of life in medieval India by the author of several best-selling historical novels. Indu Sundaresan graduated in economics from India and went to the US where she did an MS in operations research and an MA in economics. Her first novel, The Twentieth Wife, won the 2003 Washington State Book Award. Her second novel, The Feast of Roses, is a sequel to the first and continues the story of Empress Nur Jahan.